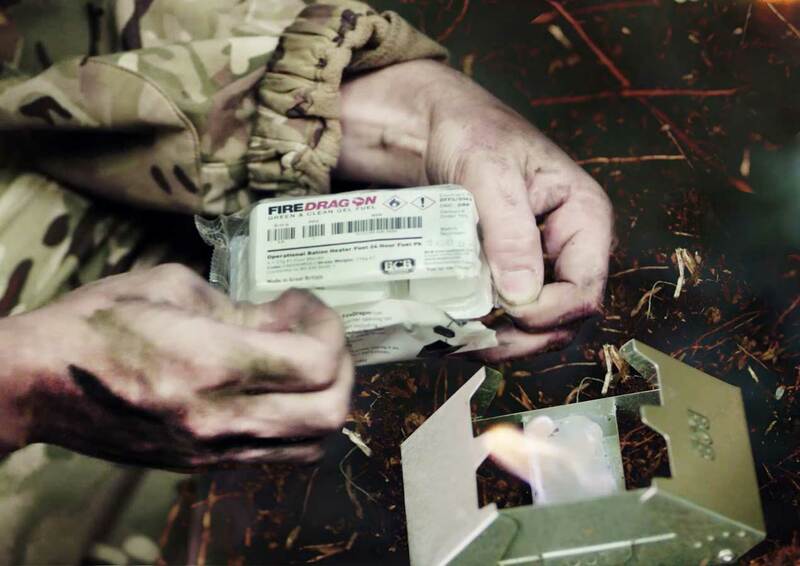 In the words of Napoleon and Frederick the Great, “An army marches on its stomach,” and when it comes to army ration packs, there have been some ground-breaking innovations in recent years. The most noteworthy perhaps is the “three-year pizza” developed by the Natick Soldier Research, Development and Engineering Center in 2013 for US soldier Meals Ready to Eat, or in common parlance, ration packs. Whilst most of the research & development has gone into developing meals that are nutritious, boost soldier morale by providing them with some of their favourite food items (ice cream, pizza) that can be easily transported and survive for long periods out in the field, more recent developments have focused on the fuels used to heat the food. Howell says BCB is in discussions with several armies that are interested in integrating FireDragon into their operational ration packs. The fuel is supplied with a small lightweight cooker, which can be packed with three FireDragon fuel blocks.